The Division of Blood and Marrow Transplantation (BMT) at Children’s is a leader in providing allogeneic blood and marrow transplantations for children with a variety of disorders. The first allogeneic BMT was performed at Children’s in 1988. Since then, the BMT transplantation team has performed nearly 500 allogeneic blood and marrow transplantations. Children’s patients have access to cutting-edge treatments through several clinical trials for allogeneic blood and marrow transplantation. In addition, the Patient and Family Support Program provides comprehensive mental and psychosocial services and helpful resources for all patients treated in Children’s Center for Cancer and Blood Disorders, as well as patients’ parents and siblings. Although Children’s oncologists refer many patients for allogeneic transplant, the Children’s transplant team also works with subspecialists at other hospitals in the region and across the country to provide the transplant-related portion of a patient's treatment. Once that part of the treatment is complete, patients return to the care of their subspecialist for either further treatment or follow-up. 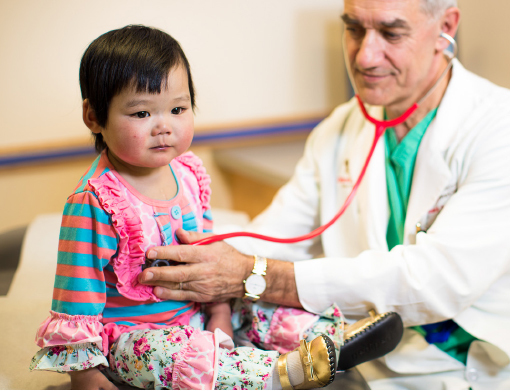 The transplant doctors at Children’s remain available to treat, or help the subspecialist treat, any transplant-related complications. Blood and marrow transplantation is a special therapy for patients with cancer or other diseases which affect the bone marrow. Allogeneic transplantation is a procedure in which a person receives hematopoietic1 (blood-forming) or blood stem cells, from a genetically similar, but not identical, donor. Blood stem cells are found in the bone marrow, peripheral blood, or umbilical cord blood2 . What are the conditions treated with allogeneic transplantation? Myelodysplastic syndromes and juvenile myelomonocytic leukemia (JMML) as soon as a suitable donor is identified. Allogeneic bone marrow transplantation is the only curative therapy available for patients with these conditions. Children’s BMT team works closely with the Division of Genetics and Metabolism and the Division of Neurology to provide a comprehensive management program for children with these diseases undergoing allogeneic transplantation. Globoid Cell leukodystrophy or Krabbe disease. Related donors are full siblings (or very rarely, other family members) of the patient who have the same tissue type as the patient. Tissue typing is usually determined by blood tests done on the patient and family members. Unrelated donors are individuals who have agreed to serve as volunteer donors if called upon whose tissue type very closely matches that of the patient. When a patient is in need of allogeneic transplant, the first type of donor generally considered is an adequately-matched related donor. However, almost 75 percent of all patients who need a blood or marrow transplant (BMT) lack such a donor. In this case, unrelated donors are located through the National Marrow Donor Program (NMDP). The NMDP initiates and facilitates the search for unrelated donors, which allows Children’s transplant physicians to access a world-wide registry of more than 10 million adult volunteer donors and public cord blood banks. Once a donor has been identified as the best match for the patient, the donor has a pre-transplant evaluation, including a physical examination and multiple tests to evaluate the donor’s blood and organ functions. The donor will be evaluated with a physical examination and blood tests to make sure that he or she can serve as a bone marrow donor. Interviews with a social worker and where indicated, a psychologist, are also an important part of the process. Peripheral blood stem cells (PBSC) are collected by apheresis, the process of extracting blood components from the peripheral blood with the help of a medical device that sorts blood into its separate factors. Bone marrow harvest involves collecting stem cells with a needle placed into the soft center of the bone, the marrow. Most sites used for bone marrow harvesting are located in the hip bones and the sternum. The procedure takes place in the operating room and the donor is anesthetized during the harvest and will not feel the needle. In recovery, the donor may experience some pain in the areas where the needle was inserted. Umbilical cord blood is collected after delivery, when the placenta and umbilical cord are separated from the infant. The collection site is cleaned to prevent bacteria from entering the collection process. The blood contained in the cord is collected in a sterile container, tested for type and the presence of viruses5 or disease, and stored in special freezers. Medical history and physical evaluation: Up to 21 days before transplantation, the child comes to the hospital to receive a complete medical history and physician examination, including multiple tests to evaluate the child’s blood and organ functions. Preparative chemotherapy and radiation: Two to seven days before transplantation, the patient receives a high-dose of chemotherapy alone or with radiation, depending on the condition being treated, to destroy the patient’s bone marrow in order to create space for new marrow/stem cells to grow. In patients with cancer, this treatment also will help eradicate any residual cancer cells. After chemotherapy, the patient receives blood-forming stem cells that were collected from the donor. The stem cells are given intravenously, just like a regular blood transfusion. The blood-forming stem cells automatically migrate and stick to the spots in the bone marrow within a few hours. It takes two to three weeks for the stem cells to mature and begin to produce significant numbers of new blood cells, which is called engraftment. Although engraftment begins two to three weeks after transplantation, it can take months or years for the entire immune system to fully recover. The first 100 days is a critical time in the transplant process. Children’s transplant team monitors patients closely for infections and low blood counts, requiring patients to remain in the Washington, DC area for frequent follow-up visits. Depending on a child’s condition, he or she may need to stay in the hospital. Graft-versus-host disease (GVHD) occurs when the immune cells of the donor (graft) sense that cells of the patient (host) are different from them and attack them. This can be a serious complication of a transplant in up to 10 percent of patients who undergo transplantation from matched related donors. However, this attack also can contribute to the curative potential of BMT for patients with cancer. GVHD can be acute (occurring less than 100 days after the transplant) or chronic (occurring more than 100 days after transplant). It may damage the transplanted child’s skin, liver and/or the intestinal tract. Drugs are given to prevent or limit GVHD. Severe graft-versus-host disease that does not respond to treatment can lead to death in approximately 5 percent of patients who undergo matched sibling donor transplants. Graft failure/rejection6 . There is a 5 to 10 percent risk (one in 20 to one in 10 chance) that the new bone marrow from a matched family member will be rejected by the patient. The chances for rejection may be higher if unrelated donors are used. Veno-occlusive disease7 (VOD). Blood vessels that lead into and pass through the liver are prone to damage after transplantation. This may result from chemotherapy and may lead to swelling and severe liver damage. The chances of severe VOD are less than 5 percent. Nutrition problems. The stomach and intestines are sensitive to chemotherapy. Nausea, vomiting, mouth sores, diarrhea, and loss of appetite may occur. Nutrition may be given intravenously or via nasogastric tube feedings until patients are able to eat. Pediatric nutritionists are part of the BMT team to help in managing these complications. Low blood counts. While waiting for new stem cells to make normal red blood cells8 and other blood cells, a patient usually needs transfusions of platelets9 and red blood cells, depending on the patient’s clinical condition. Social and emotional concerns. Transplantation is a challenge to both patient and family. They will encounter disruption of family relationships, absence from home, and isolation from school, friends and relatives. The family is the key to supporting the child through the transplant period. During this time, the Center for Cancer and Blood Disorder’s Patient and Family Support Program team is available to help families cope with these issues. Infertility. It is highly likely that transplant recipients will not be able to have children in the future due to side effects of chemotherapy drugs used during the preparative phase of the transplant. Sperm and egg collection and storage would be considered for all post-pubertal patients. Whether your child needs a simple blood test or more advanced laboratory procedure, we understand it can be a frightening experience for a child and difficult for parents. Our blood and bone marrow disease experts provide advanced transplant procedures for children and teenagers. Aplastic anemia occurs when the bone marrow produces too few of all types of blood cells: red cells, white cells, and platelets.